I picked this book out of a clearance bin, during an escape weekend to Halifax early in January,.thinking that it was one of the novels in the Dark Hunter series. Instead, I found myself swept into Kenyon’s science-fiction universe featuring star systems and worlds where the League is law. Having devoured novels by this talented author before, I knew from the very first chapter that I was in for a treat. Once I got over my initial confusion at not being able to place myself into the Dark Hunter series during the opening chapter, I settled in to enjoy the complex tale and society that she had created. Science Fiction is one of those genres that is either masterfully written, detailing alien cultures and societies so intricate that we feel as if we grow to know them, or so badly crafted as to feel hokey and contrived. With her talent to create such memorable characters as the charming teenage “man dork” from her Chronicles of Nick YA series, I had little doubt that Kenyon could write believable stellar backdrops for this series of personalities. 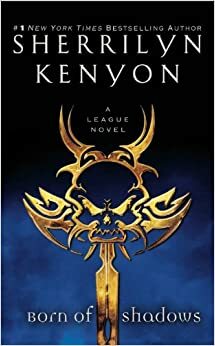 What took me by surprise, was the depth with which Kenyon took Band left me wanting to hunt down the others in this series like one of her League bounty hunters! The fact that Born of Shadows seemed to be the fourth in the set meant little due to the way in which Kenyon satisfyingly pens her intricate plots that are able to stand alone by themselves against the larger tapestry of the universes she creates. I have no doubt that knowing more about some of the other characters that came to the rescue of Callen Dagan, galactic soldier of fortune, might have added a deeper level of enjoyment and understanding of potential inside jokes, but this book remained strong and true on its own. In one frenzied reading, I found myself drawn into the tangled web of a street rat mercenary suddenly elevated to nobility when he turns out to be the long-lost son of a powerful planetary figure. Throw in a beautiful warrior princess from a nearby solar system and a vicious plot to pit their cultures against each other with some murder and you have a thoroughly enjoyable romp that steams and sizzles from cover to cover. WIthout a doubt, I will now be trying to track down the other League novels in the series to add to my CBR7 challenge, regardless of whether they are in a sales bin or full price!